Candles have been in use past many years with the continuous shift in its application and demand. In the current scenario candles are not only used light and heat purpose like earlier times, but also for decoration, fragrance and aroma. Candles are manufactured in different shapes, sizes, colors and fragrances. Europe candles market is significantly impacted by the wax suppliers, wick suppliers, container suppliers, equipment manufacturers, fragrance houses and testing laboratories. Candles are the eco-friendly source of light and heat, which primarily uses paraffin wax as the raw material. Paraffin wax is derived from the petroleum products, and the rising prices of petroleum and the declining oil and gas industry due to the concerns over non-renewable energy sources, are expected to negatively impact the candles market. Further, European Candle Association (ECA) is the guiding organization for the growth and development of Europe candles market and to maintain the quality and supply of the candles in the European countries. Europe annual candles consumption is estimated at nearly 740,000 units in 2017. Goldstein Research analyst forecast that the Europe candles market is set to grow at a CAGR of 4.3% over the forecast period (2017-2025). Basic candles segment accounted for large market share of 38.4% in 2017 followed by fancy candles and scented candles. Scented candles segment is expected to dominate the market share in future, growing at a CAGR of 5.0% over the forecast period. Based on geography, Germany accounted for largest market share of 23.4% in 2017 closely followed by the U.K. and Netherlands in terms of consumption. Within the European region, Poland is the largest supplier of candles with 28% market share in 2017 followed by Germany (17%) and Netherlands (16%). The report covers the present ground scenario and the future growth prospects of the candles industry for 2017-2025 along with the market players’ analysis. We calculated the market size and revenue share on the basis of revenue generated from major players in the Europe region. Europe Candles Market Outlook 2017-2025, has been prepared based on an in-depth market analysis from farm market experts. 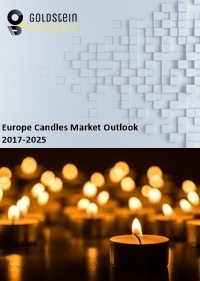 The report covers the competitive landscape and current position of major players in the Europe candles market space. The report also includes porter’s five force model, SWOT analysis, company profiling, business strategies of market players and their business models. “Europe Candles Market Report” also recognizes value chain analysis to understand the cost differentiation, pricing models to provide competitive advantage to the existing and new entry players. Our Europe candles market report comprises of the following companies as the key players: Jarden Corp, Blyth, Bolsius, Dianne's Custom Candles, Colonial Candle, Candle-lite, S.C. Johnson & Son, Gies, Vollmar, Chesapeake Bay Candle, Kingking, Talent, Pintian Wax, etc. The study was conducted using an objective combination of primary and secondary information including inputs from key participants in the farm market. The report contains a comprehensive market and vendor landscape in addition to a SWOT analysis of the key vendors.